I recently completed the art to the next issue of Rob Hanes Adventures (#11), but the fly in the ointment is the fact that, as reported at the end of last month, my scanner died, which has effectively stopped me from being able to complete the issue for now. I’m currently awaiting the arrival of its replacement—I had purchased a new one shortly after the other one stopped working, but received a scanner different than the one I had ordered, so I’m currently in the process of exchanging it. On other update fronts, Comic-Con International (CCI) has confirmed my small press table at the San Diego comics convention July 24-27, 2008. You’ll be able to find me at the same booth I’ve occupied the past three of four years, at Booth S14 in the Small Press Area—more information to come about the show as we get closer to the convention. 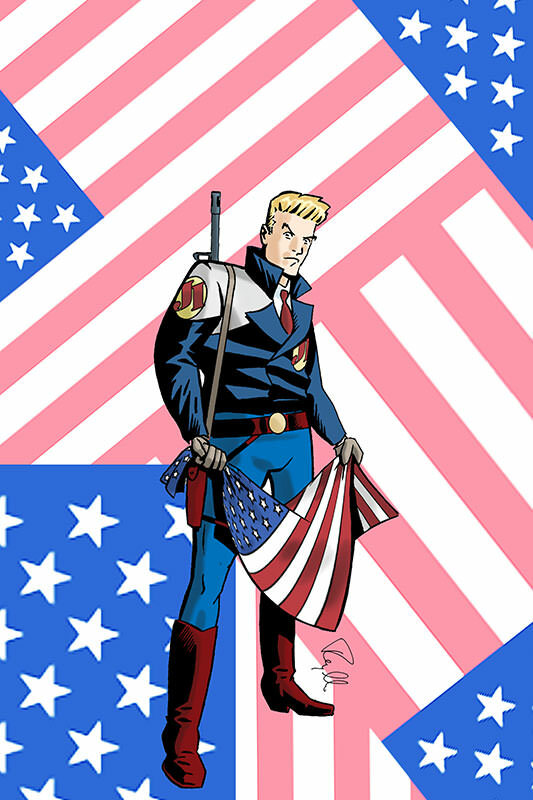 Then in the next few weeks, I’ll be posting my contribution to this year’s CCI San Diego souvenir program—a tribute to the 25th anniversary of American Flagg! To whet your appetite, below is my published contribution to last year’s program—click here or on the image to see it full size.